Average Cartridge Yield 3,500 standard pages. Declared yield value in accordance with ISO/IEC 19752. 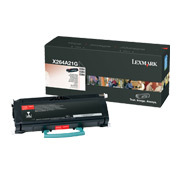 Get the most out of your Lexmark Technology by using genuine Lexmark supplies – value, quality, and environmental responsibility you can count on. 3,500 standard pages Declared yield value in accordance with ISO/IEC 19752.